Celebrate Austin Humane Society’s 65th anniversary with i Fratelli Pizza North Austin on November 20th. i Fratelli will be donating 15% of sales from referred customers! Be sure to mention Austin Humane Society during checkout to help Austin’s homeless pets in need! Applies at all locations, for take-out or free delivery. 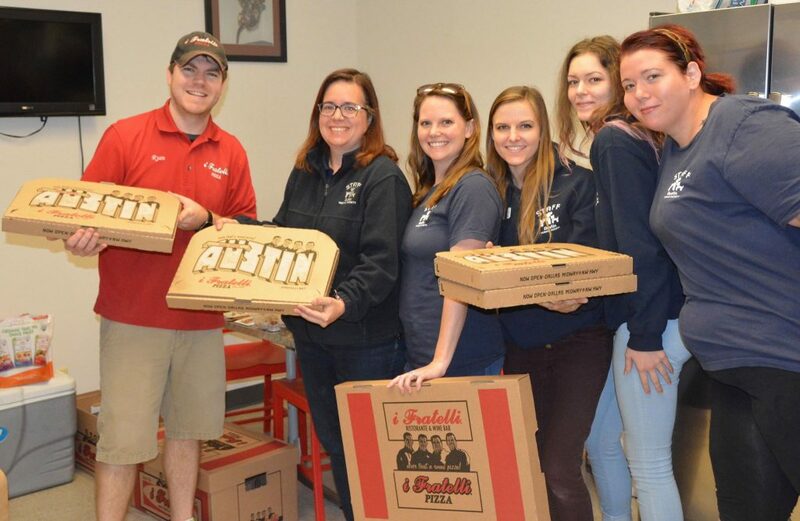 Ryan Rinker surprises Austin Humane Society volunteers with their fave thin-n-crispy pizza. i Fratelli Ristorante & Wine Bar is now Lamberti’s. You can still get your favorite thin-n-crispy pizza at 14 i Fratelli Pizza locations. Mention First 3 Years with order at any location on Monday 11/13 and they’ll receive 15% back. Applies at all locations, for carry out or delivery, as part of our DoughNation program.